The curious tale of the world’s first computer programmer. Today I stray a little from the ordinary literary and educational news updates, after coming across a nod to an exceptional woman I couldn’t pass the day without commemorating, not only for her role in mathematics, but also for her role as a woman in mathematics, far ahead of her time. I hope that her story inspires women in the sciences, or indeed anyone who perseveres to think beyond the capabilities of modern technology. I was curious. Who was this woman in 19th century garb, scribbling mathematical functions with quill and ink? And so, by way of technological error, I learned of Ada Lovelace, the world’s first computer programmer. 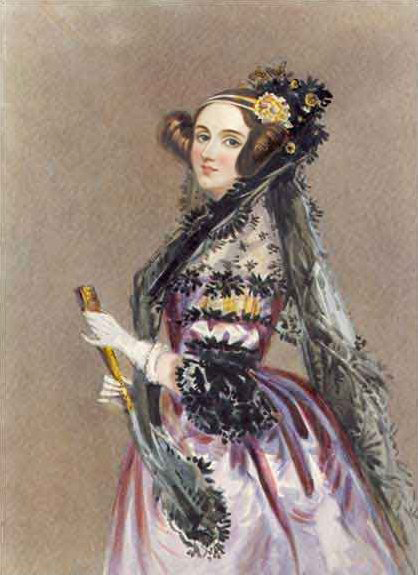 Ada Lovelace was born on December 10th, 1815, to the poet Lord Byron and his wife Anna Isabella Byron. She had a miserable childhood, considered a disappointment from birth for not having been born a boy. Ada was abandoned by her father before she was a month old and resultantly never knew him, as he died abroad when she was eight. Meanwhile her mother chose to keep little connection with her, possibly because young Ada reminded her of her devious husband, with whom the Baroness had an acrimonious divorce. So Ada was raised by elderly relatives and relegated to a life of suspicious observation via her mother’s friends, dubbed “the Furies.” Fortunately for us, though, she was also subject to a life of education–intended to squash any deviation she might have inherited from her father–and took a keen interest in mathematics from a young age. Around the age of seventeen, Ada’s special abilities became clear to her tutors, all famed in mathematics in their own right. The noted mathematician Augustus de Morgan even reported of Ada to her mother that she seemed destined to become, “an original mathematical investigator, perhaps of first-rate eminence.” Meanwhile another one of Ada’s instructors and friends, Mary Somerville, introduced her to Charles Babbage, future inventor of the world’s first computer. Ada was not yet eighteen at the time. Supposing, for instance, that the fundamental relations of pitched sounds in the science of harmony and of musical composition were susceptible of such expression and adaptations, the engine might compose elaborate and scientific pieces of music of any degree of complexity or extent. Along with these forward-thinking notes, Ada wrote “a computation of Bernoulli numbers for the Analytical Engine” (below). It is this part of her thesis, “Note G,” that is universally considered to be the world’s first computer program, making Ada correspondingly its first programmer. So there you have it: the world’s first techie was a noble lady, The Right Honourable Countess of Lovelace. That means that on this day, as you browse the Internet in search of Google poetry, GIFs, or the Ikea Monkey, you have Miss Ada Lovelace to thank for her place in imagining the capability of computers to change our lives in the myriad of ways they have today. Teachers, instruct your students on the history of “The Enchantress of Numbers” with eNotes’ document on Ada Lovelace, found here. It comes with an activity to help students write their very own programs and is recommended for Grades 4-8.